South Africans live in a country blessed with beauty and diversity. We share a country with a colourful history having overcome rather significant and unique challenges. However proudly South African, we may be, we have to admit that we face serious challenges to safety daily in our homes, places of work and on the roads! It is not only the irresponsible road user giving a lift to the shady hitchhiker who is at risk, but each and every responsible driver, passenger, biker or cyclist! 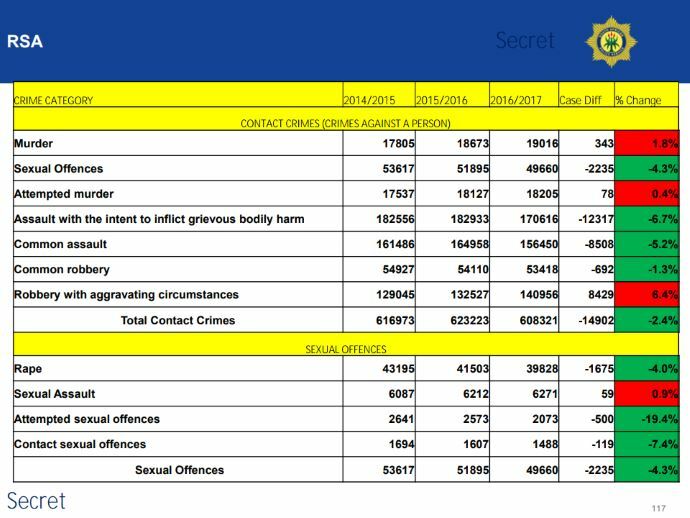 In this section, we would like to take a closer look at the impact of crime on our efforts to make roads safer! We will also reflect on some of the successes by law enforcement to address these concerns. This division comprises those crimes that are detected during a police action and are naturally supposed to depict an upward trend. These include Unlawful Possession of Firearm and Ammunition, Driving Under Influence (drugs and alcohol), and Unlawful Possession of and Dealing in Drugs. Through a closer analysis of these crimes, the relevance and threat to different types of road users and traffic conditions become much more evident! We would like to share actual examples over the past few years with some images to illustrate the risks presented by criminals. Theft of cables which reduces lighting on our streets, reducing visibility and endangering lives of drivers & pedestrians. Theft of cables causing many traffic lights at intersections to be malfunctioning or out of order. Theft of crash barriers and man-hole covers sold as scrap metal. Fences are stolen especially in rural areas & next to informal settlements, creating increased risks of animals entering and crossing roads. Stones and other large obstructions placed on the roads with the intention of causing vehicles to crash and providing an opportunity to rob crash victims. Stones thrown from cross-over bridges causing road crashes & leaving the victims defenceless to robbery. Safe driving requires the responsible sharing of the roads with many other road users. Unfortunately, it is not only law-abiding citizens commuting or crossing the road surface. Those who commit serious and violent crimes are less likely to obey the rules of the roads! A significant and increased threat is posed by the following road users. Those who are impaired and driving under the influence of drugs and alcohol. Those who use the roads for their criminal activities and transportation of the proceeds of crime. 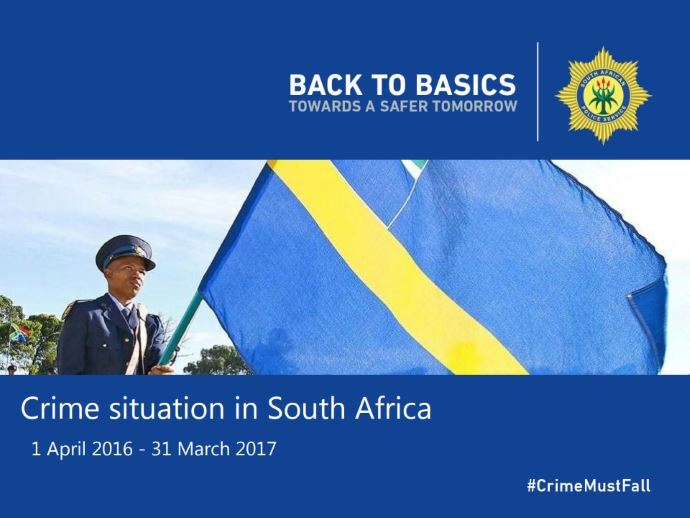 Criminals referred to as the “Blue light gangs” who present themselves as being police officials only to hijack and rob innocent road users. Criminals on motorbikes recently brought a tourist bus to a stop, robbing the passengers. Criminals who commit crimes elsewhere and use the roads irresponsibly as an escape route in their attempt at a fast “getaway”. Cash in transit robberies not only endanger the lives of security guards but also all those who share the roads with these vehicles. Taxi violence and conflict between taxi associations are placing the lives of both drivers and commuters ar risk. Note: Click any banner to view the associated statistics. How significant is the threat posed by drunk drivers? When we consider crime as a threat to road safety our first thoughts are about hijacking, theft of vehicles and smash and grab. These are the stories most likely to make the headlines. It is important to remember that not all crimes are violent and that criminals have also devised some clever strategies to take possession of vehicles and the contents thereof. Hijacking -The most violent of road crimes. Smash and Grab - Violence used to rob the unsuspecting motorists at intersections and stop streets.  Vehicle Theft: Non -violent means of taking ownership through some clever strategies such as those aimed at stealing vehicles at dealerships, workshops where vehicle repair is taking place etc. Theft of vehicles and contents through immobiliser jamming devices and other clever use of technology. Theft of other modes of transport such as mountain bikes and road bikes. There is also a new trend towards bike-jacking! Joggers/ Runners are also exposed to criminal attacks and we urge these road users that there is indeed strength in numbers. There have been significant successes in combatting some of these crimes. This can be attributed to both increased law enforcement and the use of advanced vehicle tracking technology. One of the major concerns for government and transport officials is the need to reduce fraud and corruption in the traffic environment. Corruption or bribery is described in legal terms as the practice of tendering [and accepting] a private advantage for the performance of a duty. On a grand scale, money intended for maintenance of roads or service provision and the upgrading or provision of facilities is diverted for private gain. On an immediate level, unqualified drivers and non-roadworthy vehicles are granted licences and certificates. By accepting a bribe and offering a non-competent driver a driving licence we present a threat to anyone sharing the road with that driver. During the past year, several driving licence testing stations have been closed down on account of corrupt activities. Drivers and commuters are at risk with every non-roadworthy vehicle certified to go on the roads. This includes not only testing of the vehicle mechanisms but also testing for overloading. 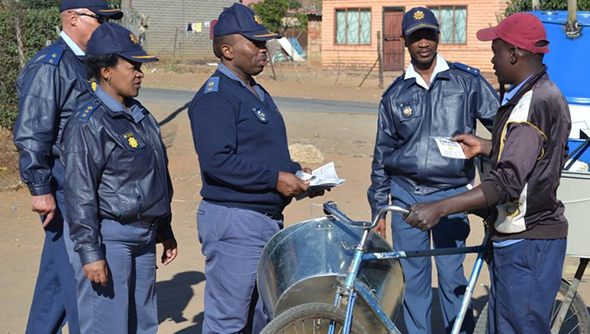 The most common type of corruption encountered by South Africans daily are those when a traffic official is bribed to either reduce of nullifying the fine for a traffic offence committed. By allowing this to continue our roads become a “free for all” where road users recklessly and willingly disobey the Rules of the Road with the assumption that they can get away with any penalty for their misbehaviour! We too often find that offenders cannot be effectively dealt with as the cases are “bungled”. Blood samples, dockets and other evidence go astray or get lost, pointing towards further corrupt activities. We also find incidents of doctors & lawyers defrauding the Road Accident Fund. This has an impact on our ability to provide post-crash relief and assistance to road crash victims. Every minute spent having to attend to a stab wound or the injuries from domestic violence is a minute potentially lost to the victims of a road crash! Our paramedics and first responders have to attend to victims from numerous crimes day and night which allows little/ less time available on the roads. An alarming new trend has been incidents of violence committed towards our paramedics attending road crashes and other scenes of emergency. The theft of equipment and materials from ambulances, hospitals and paramedics reduce the ability to provide a swift and effective response to road crash victims! What can road users do to reduce the impact of crime on our roads? An informed road user is a safer road user! On the Arrive Alive website and several insurance blogs, we advise road users of the risks presented by criminals and the latest techniques they use. It is important that we all stay well informed of the threats and share with one another advice and recommendations on how to protect ourselves. It is also important to pay attention to warning signs alerting us to specific hazards. Approaching and crossing intersections with caution. Staying alert at night to the possible presence of animals on the roads. Avoiding distractions and keeping all the focus on the traffic and road conditions. Keeping an eye and ear on the media to stay informed of possible road closures in times of protest action. Rather take the recommended detour. We should not leave it to the police and other enforcement agencies to tackle crime on their own. 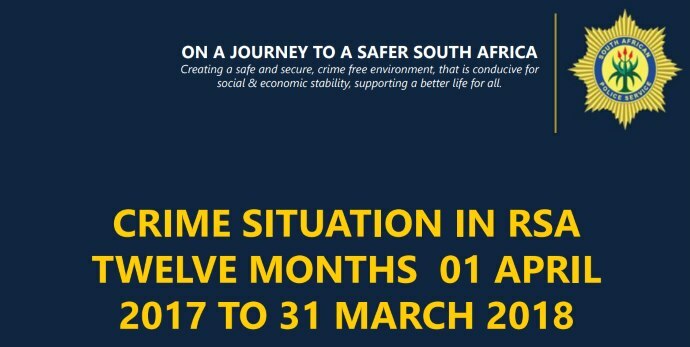 Even though we strongly advise against confronting criminals ourselves, we can assist in reporting criminal activities and providing tip-offs for a follow-up! Even the best driver may fall victim to crime. We may not be able to prevent a road crash but we may well be able to reduce the impact thereof and the severity of the injuries. We would like to urge road users to remain vigilant,buckled-in, non-distracted and to pay close attention to road and traffic conditions. Ensure that you allow yourself enough time and space to respond to emergencies and make adequate provision for health, medical and car insurance cover. Conclusion - Make a difference! 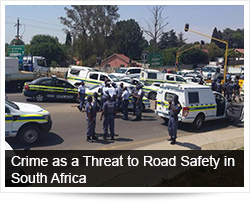 Safer roads will only be possible if we also manage to reduce crime in South Africa! We can contribute towards safer roads by responding to the calls for safety. There are several NGO’s and road safety initiatives which address a variety of aspects needed to make our roads safer. These include both preventative measures as well as rehabilitation of offenders. By rendering assistance and supporting these initiatives we can create greater safety for all!